What do the ranks and rank symbols (insignia) stand for? Fire departments in the United States are usually structured in a paramilitary manner. This means that we follow a rank and hierarchy much like the military. At the top of a department you have the Chief(s). In Southampton, we have three chiefs. While the Chief of the Department (30) is responsible for all operations of the department, he or she has a staff which takes on responsibilities to allow for tasks to be completed more efficiently. One example is our 1st Assistant Chief, (31) is responsible for all department training and 2nd Assistant Chief (32) is responsible for all equipment. Under the chiefs, we have five companies each with its own company officers. Each company has a captain which is responsible for all company operations. First lieutenants are responsible for company training and our second lieutenants are responsible for company equipment. Each officer also takes on special committee assignments such as fire prevention and public information. 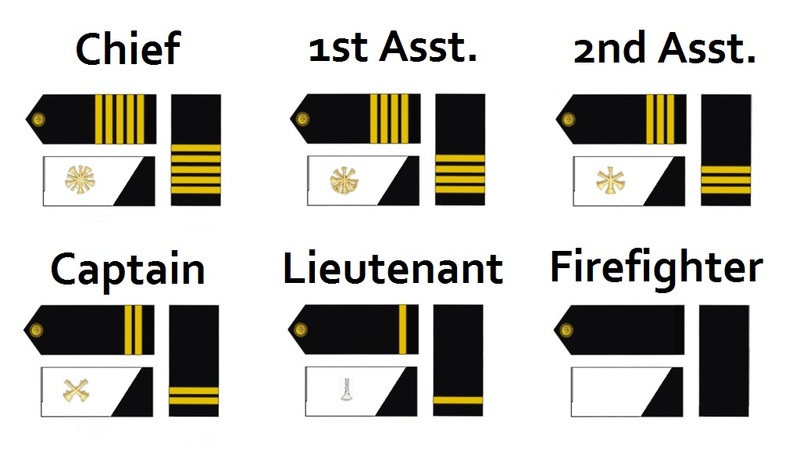 The following are examples of common rank insignia found in the fire service.